After making a lot of heads turn with his debut venture Raja Rani, promising young director Atlee is now all set for his second film with none other than Ilayathalapathy Vijay (Vijay 59). The core Raja Rani crew of composer G.V.Prakash and editor Ruben would work in 'Vijay 59' as well, while art direction would be taken care by Muthuraj. 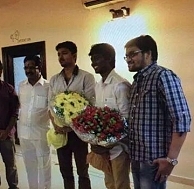 A snap of the young 'Vijay 59' crew along with Vijay and producer Kalaipuli.S.Thanu is going viral since yesterday night. We hear from our sources that this film would be an action entertainer with the typical Atlee touch. Stay tuned for more on this upcoming extravaganza which would kick-off in 2015 after Vijay wraps up his Chimbudevan film. After Vijay, it's GV Prakash and Nakul ! No lead heroine for Vadivelu !!! Will Kaththi be declared a BLOCKBUSTER? People looking for online information on Atlee, Editor Ruben, G V Prakash, Ilayathalapathy Vijay, Vijay 59 will find this news story useful.